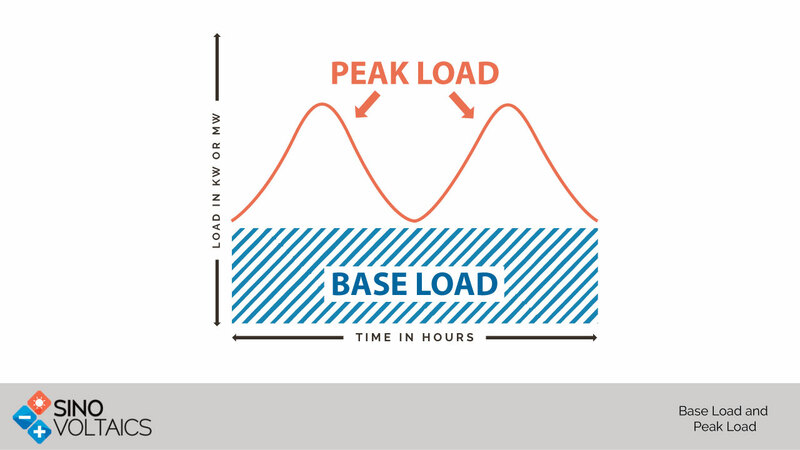 What are Base Load and Peak Load? Load, in electrical engineering, is the amount of current being drawn by all the components (appliances, motors, machines, etc.). Load is further categorised as base load and peak load depending upon the nature of the electrical components connected. As you may be familiar, all electrical appliances at your home do not run at all times. Lighting in the house is only required during the evening and so on. There are several appliances which keep running at all the times, no matter what. The refrigerator, for example, has to be plugged in at all the times. Another such example are the heating, ventilation and cooling systems in the house (HVAC system). Base load is the minimum level of electricity demand required over a period of 24 hours. It is needed to provide power to components that keep running at all times (also referred as continuous load). Peak load is the time of high demand. These peaking demands are often for only shorter durations. In mathematical terms, peak demand could be understood as the difference between the base demand and the highest demand. Now going back to the examples of household loads: microwave oven, toaster and television are examples of peak demand, whereas refrigerator and HVAC systems are examples of base demand. Now on a broader perspective, it could be assumed that the electrical grid is a big household. Under normal circumstances, the power required by the electrical grid is fairly constant during various period of the day. This constant power, which is required at all times, is called the base loading. But during a special event, like the final match of World Cup, the demand will be more, as a lot of people will watch TV. This short, high demand period is considered to be a peak loading. Power plants are also categorised as base load and peak load power plants. Plants that are running continuously over extended periods of time are said to be base load power plant. The power from these plants is used to cater the base demand of the grid. A power plant may run as a base load power plant due to various factors (long starting time requirement, fuel requirements, etc.). To cater the demand peaks, peak load power plants are used. They are started up whenever there is a spike in demand and stopped when the demand recedes. I can now tell the difference. Very good explanation , with example. Nice write up. I learnt from this. my quest satisfied. thanks for nice explanation. very nice explanation,now i understood. Good explanation, but would have been more professional if graphical representation was shown. A significant fraction of the average wind power production is available with 95% or greater probability, and so may be used for baseload power. Good answers and easy to understand. It’s explained in a very simple, yet comprehensive way. Keep up the good work. While this provides a basic understanding, the examples of which powerplants are for base load and which are for peaking is incorrect. Peaking plants are controlled to provide power during maximum demand periods. Solar and wind are not used for peaking because they are not usually controlled, but are administered as “must-take” energy and run whenever environmental conditions are favorable. Generally, base-load generators are those with long process stability times, such as nuclear, bio-mass, or co-gen, and other generators which utilize processes which have quick response times are used to peak.